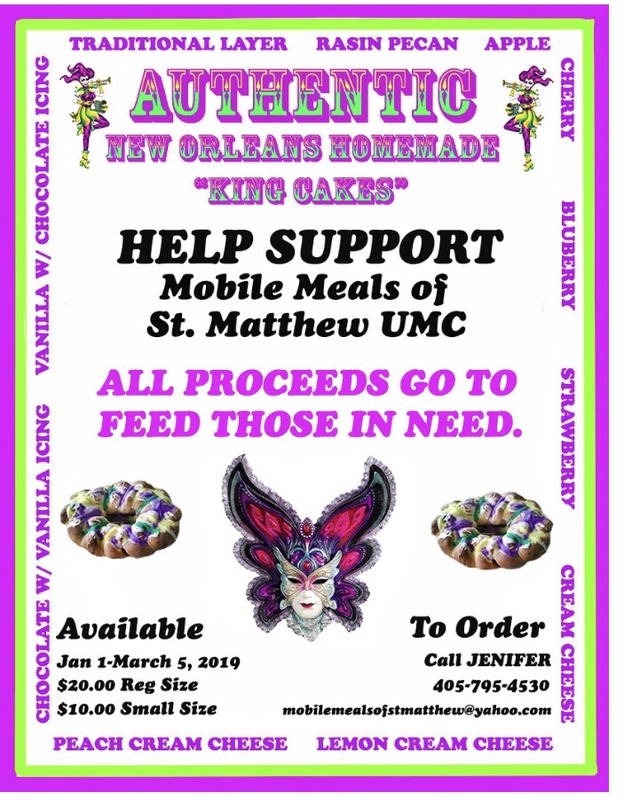 The Midwest City Mobile Meals program is conducting their annual fundraiser of handmade traditional Mardi Gras KingCakes. The founder of both the program and fundraiser is Jennifer Cameron, who is a New Orleans native. She brought her love of the traditional king cake here with her, and has used it as a delicious way to raise money to help feed elderly residents. The Mobile Meals volunteers were able to get all of their commercial kitchen equipment moved into the new space and are currently busy baking King Cakes. The fundraiser started January 1st and continues until Fat Tuesday on March 5th. The cakes come in two sizes, large for $20 and small for $10. There is a new flavor this year, Praline, which joins the list of available flavors including Raisin Pecan, Apple, Cherry, Chocolate with vanilla icing, and Lemon cream cheese, just to name a few. The handmade cakes are decorated with the traditional Mardi Gras colors of green, gold and purple colored sugars and then adorned with Mardi Gras beads, coins and of course the little plastic baby. The baby is hidden in the cake and the person who ends up with the piece of cake with it is made king or queen of the day. The Mobile Meals organization serves approximately 120 people a week in the Choctaw, Midwest City, Eastern Oklahoma City, Spencer and Del City areas. They hope to expand to an even larger coverage area, but they need more volunteers for that to happen. “Since the move, people aren’t really aware that we are still here, so we rely a lot on just word of mouth. Our volunteers can do several different things. Some just do the driving and the delivering and some come in and cook and prepare the meals, because it’s all homemade. We have a group that prepares the side dishes, desserts and bread which a lot of the time are premade. Then we have groups that put the meals all together,” said Cameron. The organization delivers hot meals on Tuesdays and Fridays, also delivering a bag of nonperishable food items with the Friday meal to help cover the weekend. The hot meals are enough to be split into 2 meals for the residents, which covers 4 hot meals during the week for the elderly residents. If you are interested in volunteering with the Mobile Meals program you can contact Cameron at 405.795.4530 or atmobilemealsofstmatthew@yahoo.com. You can also use that same contact information to place your king cake orders. “To volunteer they would just call or email us and we will gladly work with them with whatever they want to do. Our service also counts towards community service hours for different classes and organizations,” said Cameron. Don’t miss out on your chance this year to have an authentic handmade king cake, order one today.